Welcome To Your Senses: Anbe Venkataachalam !! Anbarasu : "look, i dont understand your jokes man !!!" Nallasivam : "Becasue, its not a joke.... முன்ன பின்ன தெரியாத ஒரு பையனுக்காக கண்ணீர் விடர மனசு இருக்கே, என்னப் பொருத்த வரைக்கும் அதுதான் கடவுள்"
Anbarasu : "huh !! heh .... thank you... என்ன திடீர்னு இந்த பணிவு ??" Nallasivam : "ஏன்னா நானும் கடவுள் !! " Anbarasu : "haaah !! நினைச்சேன் !! ஏதாவது hook இருக்கனுமே ......"
Nallasivam : "A. ARS....... You are a good man." Anbarasu : "...hmmm :) so, are you.."
Successful 50th time. 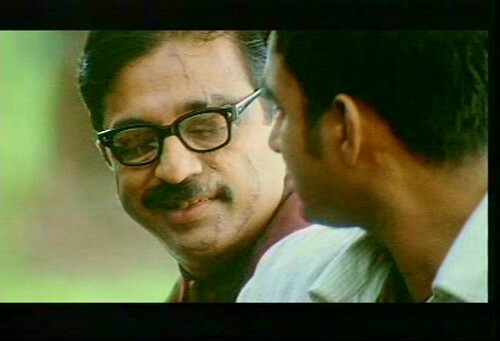 Watched my alltime fave "Anbe Sivam" yet again. Great stuff you have here..and great photoshop work. BY the way Anbe Sivam..my dear baby too. iyengar, yeah.. I love that one from Kamal.. But what was there in Panchathanthiram... are you talking about "heeey Raam.. !" conversations by devayani ? narayanan, Vijayakanth irukkara thamizh mannula Statisticska panjam.. Matrix padathukku idhukku mela irukku stats enkitta. Sindhu Bairavi VCD ? irukka ? revatechnic (? ), thanks for chancing.. :) yes. I went through your blog. good un. Kamal fanaaa ? super. join the gang. Its a really great post to add to that Ars's reply to kamals "I know ...." is "You are a last word freak" or something ... seriously Anbesivam is a delight to watch again and again..
that piece of exchange is delightful to say the least. Kamal refers to it in a comical way with superb timing in his comedies (like he quotes Nayagan in MX) and it looks like 'mocking' when the movie had failed. I know you didn't mean belittling when you said 'mocking'. But, I added this coz he refers to all his movies alike regardless of whether it was a hit or not. anonymous, yeah.. I would give Madhavan a National Award for his acting.. i think it has been overlooked.. what do you think ? zero, Nayagan in MX.. ennadhuppa adhu ? The reference to Chettiar (Santhana Bharathi) as a Seth initially. and Santhana Bharathi repeating the "Naalu paerukku nalladhu.." dialogue from Nayagan. ANBE SIVAM ORU PADAMALLA, PAADAM! Guess, a lot of people don't realise the potential of Kamal movies at the time of its release!! 'MMKR', 'Anbe Sivam' seem to feature in most people's favourites though they weren't successful at BO! i enjoy your site its a nice presentation.